An exhibition titled "Absheron" will be held in Art Tower Gallery on September 25. 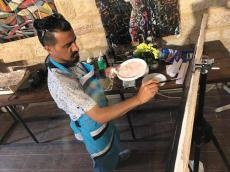 The exhibition will feature works dedicated to Absheron and created by local artists during the workshop, which will last until September 24, Azertac reported. Anyone wishing to observe the process of art creation can visit the Art Tower every Saturday and Sunday until September 24 from 12:00 to 17:00. The exhibition will be organized by the Azerbaijan Ministry of Culture and Tourism, the Administration of the State Historical and Architectural Reserve "Icherisheher" and the NGO Arts Council Azerbaijan. Entrance is free. Notably, the traditional Festival of Decorative and Applied Arts will be held in the Gallery in October. Tapestry, ceramics, batik, jewelry, mosaics, as well as photos and drawings of carpets will be shown to art lovers.